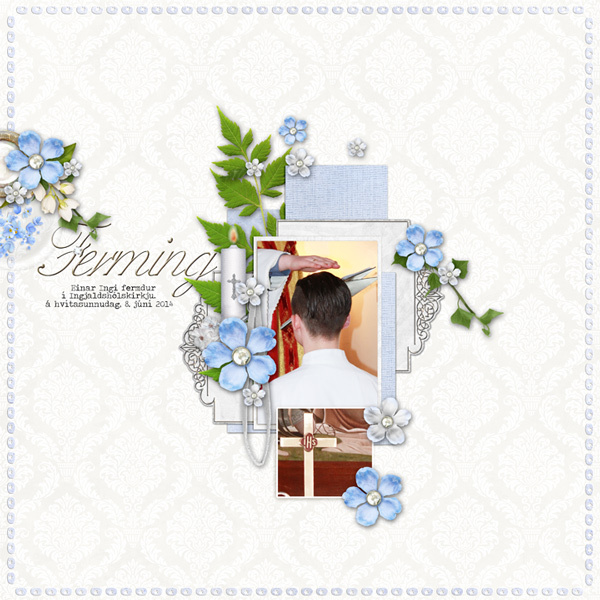 Here's a kit to help you scrap your religious ceremonies. "Sacred" encompasses the sacraments of Baptism, First Holy Communion and Confirmation, but also included, where noted, are the elements without specific references to Catholic sacraments. 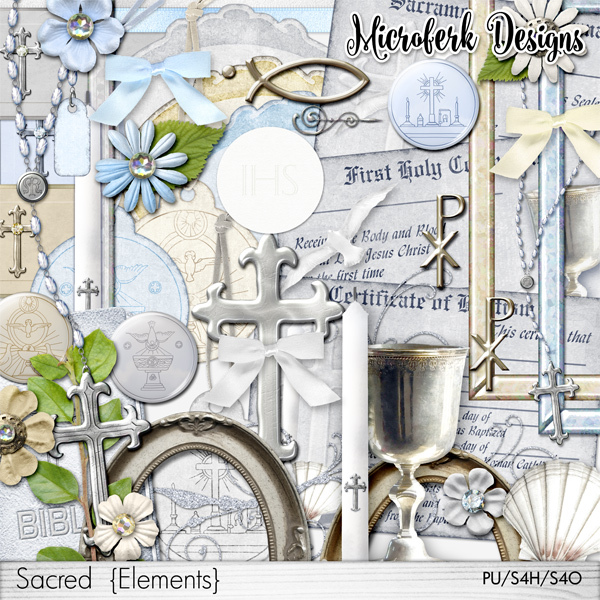 In "Sacred Elements" by Microferk Designs, you get over 40 elements that include a leather-bound Bible, white ribbon and bow, light blue ribbon and bow, creamy light gold ribbon and bow, slightly tarnished silver brad, a set of certificates for Baptism, First Holy Communion and Confirmation, with blank versions as well, the chi ro symbol, ichthys symbol, white dove, Baptismal candle, seashell, chalice, host, hand-made rosary, light blue frame both with rosary embellishment and without, light gold frame both with chi ro symbol and without, white-silver frame both with candle and without; jewelry tag- both plain and hung from a beaded charm, 3 round tags with sacramental stamps as well as 3 plain, and 3 different colored string toppers to match, 3 antiqued journal blocks, 3 elegant journal cards, a large silver cross, 6 small silk flowers, a piece of foliage, a leaf, 2 oval metal frames, a glittery swirl, and 3 pieces of flair. Each element is in its own file - no need to 'cut' apart. All elements are created at 300ppi, and saved as png files to preserve transparency. 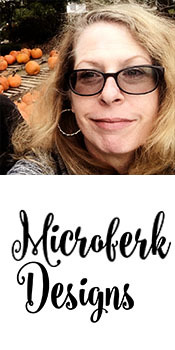 Drop shadows are only applied in instances where layering of pieces within an element necessitate shadowing for realism, unless otherwise noted in product description.